Easy Mozzarella Chicken with Sun-Dried Tomato Pesto Sauce ended up being a rather long title, but it’s an easy recipe, I promise. You won’t be needing more than 35 minutes and that includes making a special homemade sauce! This makes the Mozzarella Chicken (for short) a killer weeknight dinner. However, it is as good as any weekend dinners as well. How can this be? 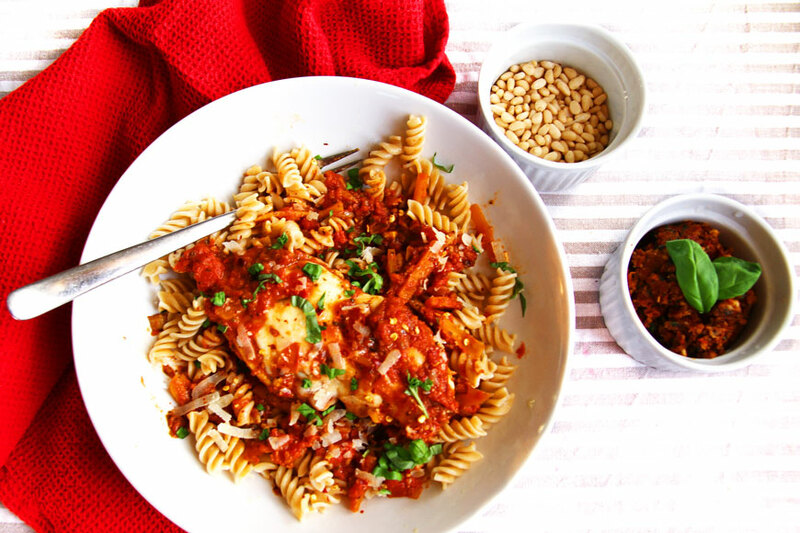 Creamy melted mozzarella chicken, fresh herbs and sun-dried tomatoes might just do the trick. This recipe is adapted from Little Spice Jar. When I made it the first time I found it slightly off, and I think I figured out why. My tomatoes were a little too tangy and I should have put a little sugar into the sauce. So that’s what we’ll do! You can begin by making a homemade sun-dried tomato pesto. This recipe makes 1 cup, but you will only be needing 2 tablespoons of it in the mozzarella chicken. Just blend all the ingredients in a food processor, apart from the olive oil. While blending, slowly drizzle the olive oil in. Adjust salt and pepper to your preferences. That is done. Now you can either have store bought or homemade Italian seasoning. As I live in Norway, it’s not an easy find, but I just found I could make my own. Mix all the ingredients together. Store the rest in an air tight container until your next batch of mozzarella chicken or anything other Italian. Preheat the oven to 200C (390F) or to a broiler setting. Now we can think of the chicken. Sprinkle each chicken breast with salt and pepper. Heat a nonstick pan over medium heat with a little bit of olive oil. Add the chicken and cook for about 3-6 minutes each side. You want the chicken to be completely cooked through. Remove from the skillet and place on a plate. Remember to cook your pasta too, this is almost done! Then we’ll continue with the tomato sauce. Add the onions to the remainders of the chicken skillet. If the oil has dried up, just add a tiny splash and sauté the onions for around 3 minutes. You want them soft and slightly browned, then you can add in the garlic and cook for 30 seconds. Add in the rest of the sauce ingredients apart from water and stir to combine. When the sauce starts to simmer, add in 4 tbsp of water, lower the heat, cover and simmer for 12 minutes. You want the sauce to thicken a little. Season with salt and pepper to your liking. 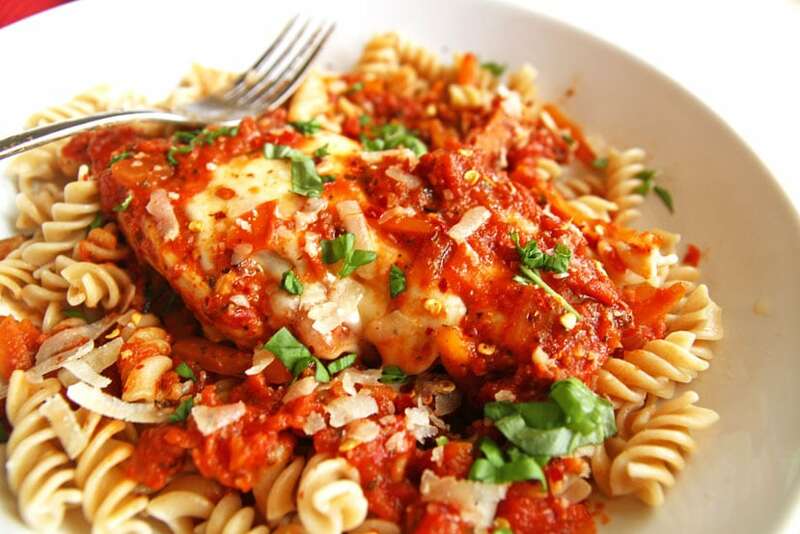 Nestle the chicken into the sauce and top each chicken breast with a slice of mozzarella cheese. 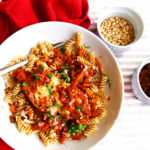 Cover the cheesy chicken with a little bit of that delicious tomato sauce (this will give the chicken a lovely color!). Place under preferably a broiler for a few minutes. A heated oven will do just fine, but it will take a little longer, maybe 5 minutes. Top with chopped parsley or basil. It’s super easy and yummy and you don’t have to spend time you don’t really have in the kitchen. Don’t get me wrong, I love to be in the kitchen, but sometimes you got to do other stuff to. Sometimes. Let me know what you think, either in the comments section below or tag me @thegingerwithspice on Instagram. And don’t forget to Pin it for later! You can have both that delicious homemade mozzarella chicken AND spare time, because this will only take 35 minutes! Sweet homemade tomato sauce with a sun-dried kick and creamy, melted mozzarella, what's not to love? 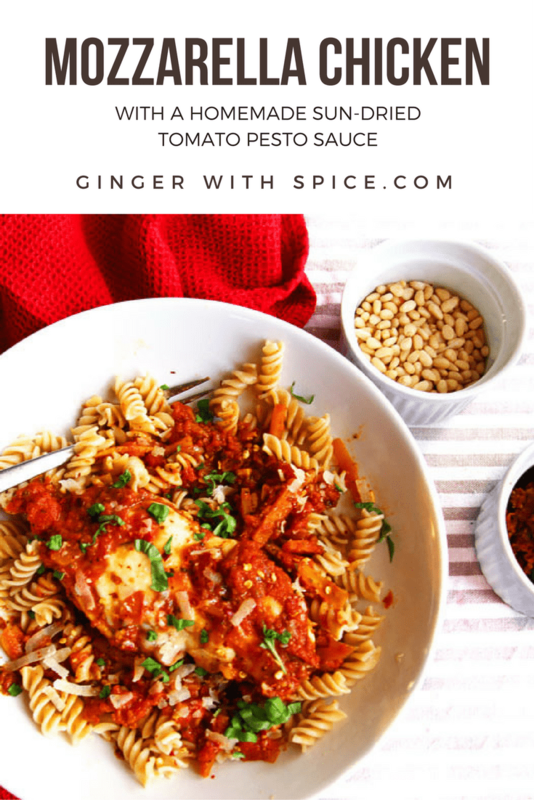 Homemade sun-dried tomato pesto: This recipe makes 1 cup, but you will only be needing 2 tablespoons of it in the mozzarella chicken. Just blend all the ingredients in a food processor, apart from the olive oil. While blending, slowly drizzle the olive oil in. Adjust salt and pepper to your preferences. 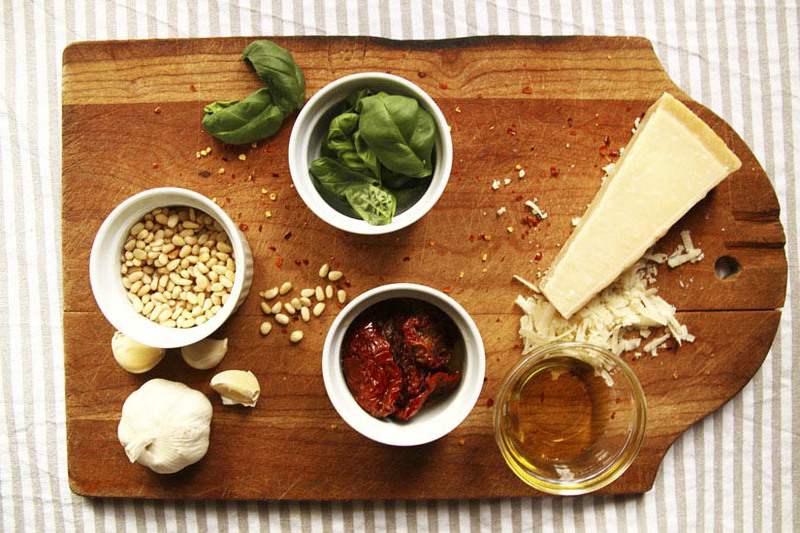 Italian seasoning: Mix all the ingredients together. Store the rest in an air tight container until your next batch of mozzarella chicken or anything other Italian. Preheat the oven to 200C (390F) or to a broiler setting, boil some pasta water. Cook pasta as instructions on packaging. Sprinkle each chicken breast with salt and pepper. Heat a nonstick pan over medium heat with a little bit of olive oil. Add the chicken and cook for about 3-6 minutes each side. You want the chicken to be completely cooked through. Remove from the skillet and place on a plate. Tomato Sauce: Add the onions to the remainders of oil in the chicken skillet. If the oil has dried up, just add a tiny splash and sauté the onions for around 3 minutes. You want them soft and slightly browned, then you can add in the garlic and cook for another 30 seconds. Add in the rest of the sauce ingredients apart from water and stir to combine. When the sauce starts to simmer, add in 4 tbsp of water, lower the heat, cover and simmer for 12 minutes. You want the sauce to thicken a little. Season with salt and pepper to your liking.